Supreme Court Registry by its order dated 15th May 2017 held that the Petition filed by Justice Karnan against the 7 Judge Constitution Bench order convicting and sentencing Justice Karnan for Contempt of Court, is not maintainable. The Registry has sent a communication to Justice Karnan’s lawyer Mathew Nedumpara that the petition is not maintainable and does not show any reasonable cause to be received for registration and that it is refused to be registered. 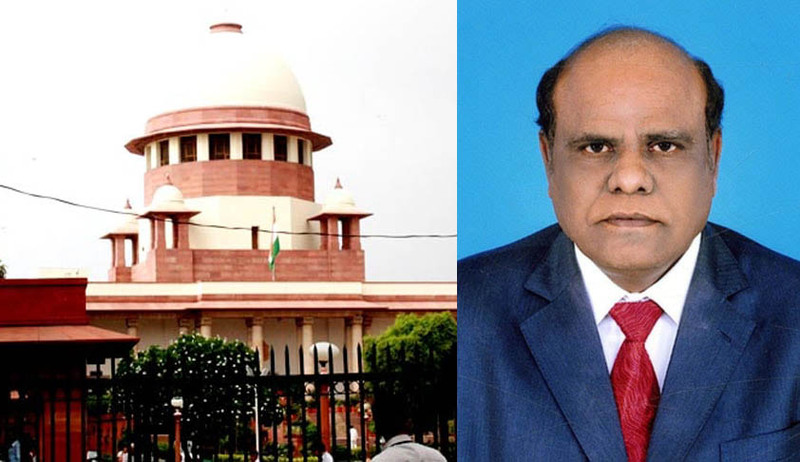 Justice Karnan had challenged the constitutional validity of the Contempt of Court Act, 1971 under Article 32 of the Constitution of India, as well as placed an application of recall of the orders against him. This was in aftermath of an order passed on May 9, wherein the 7 Judge SC Bench had sentenced Justice Karnan to 6 months in jail after finding him guilty of contempt of Court. As per a press release issued by Justice Karnan’s lawyer, Advocate Nedumpara, Justice Karnan is now planning to institute a Writ Petition before the High Court of Delhi under Article 226 of the Constitution of India. The release states that the decision to approach the High Court was taken after the Advocate was informed by the Assistant Registrar of the Supreme Court that the Petition filed by Justice Karnan has been found to be “not maintainable”, and that it does not show any reasonable cause to be received for registration. As per the Press Release, Justice Karnan would have preferred to challenge the order of the Registrar before the Supreme Court itself by way of a petition under Article 32 for violation of Fundamental Rights. He has, however, decided to approach the High Court, “considering the difficulty in getting such a petition registered as no Advocate-On-Record would be forthcoming to be on record” on his behalf. Before the High Court, he plans to challenge the Registrar’s order, as well as Order XV Rule 5 of the Supreme Court Rules, 2013, invoking which the Registrar (Judicial) has declined registration of his Writ Petition. “Justice Karnan has, in anticipation of the order at the hands of the Registrar (Judicial), already kept prepared draft of the Writ Petition; so too of the Chamber Appeal. The draft being ready, the Writ Petition will be instituted as expeditiously as it could be,” the Press Release thereafter states.